US demand for specialty fuel additives will grow 4.8 percent yearly to $1.6 billion in 2016. Cold flow improvers will lead gains due to the mandated use of more biodiesel, while deposit control agents will remain the most common type. Gasoline will remain the largest application. Blenders and terminals will continue as the largest market. 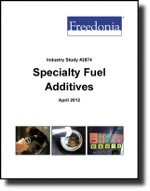 This study analyzes the $1.3 billion US specialty fuel additives industry. It presents historical demand data for the years 2001, 2006 and 2011, and forecasts for 2016 and 2021 by additive type (e.g., detergents, cetane improvers, antioxidants, lubricity improvers, cold flow improvers, petroleum dyes and markers, corrosion inhibitors), application (e.g., gasoline, diesel fuel) and market (blenders and terminals, refiners, aftermarket). The study also considers market environment factors, details industry structure, evaluates company market share and profiles 32 industry players, including NewMarket, Innospec and BASF.